Designs for a bridal bouquet are often traditional styles, such as a cascading rose, round posy or sweet nosegay. However, talented florists can customize a bouquet to match your personality, wedding colors, theme, and budget. Unique designs featured in wedding photographs provide inspiration for creating your own bridal bouquet. Add an elegant touch to a classic red rose bouquet. Small gemstones placed in the center of each flower sparkle in photographs and as you walk down the aisle. Add pearls or colored beads if rhinestones do not flow with your bridal style. Use greenery to create a halo effect around the top of your bouquet. Have the florist split large leaves into small strips and wrap them up and over the top of your flowers. The resulting bouquet is traditional with a modern twist. Feathers add a festive flair to any bridal bouquet. Peacock features are perfect additions to an elegant exotic bouquet. Continue the feather theme by incorporating them into altar arrangements and reception centerpieces. Brides who wear off-white gowns can create a bouquet that matches their dress color and style. 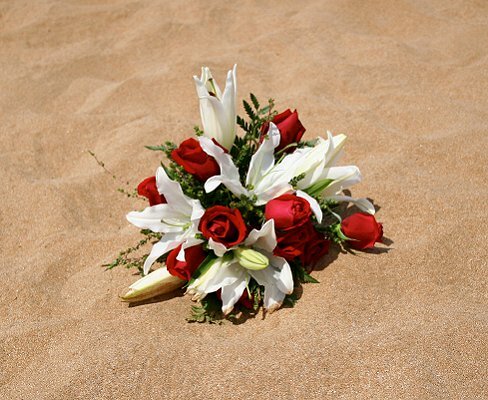 Cream, beige, champagne and ivory blooms are readily available in a variety of flowers. Bring a swatch of the dress to your florist appointment if you want to match your gown color. Not every bouquet has to include greenery or filler flowers like baby's breath. Small branches with buds or berries that match the wedding colors are pretty alternatives. If you choose to use berries, get upscale faux ones to keep them from accidently bursting and staining your wedding gown. Brides without a large budget can still have a stunning bouquet. Save money by choosing a small nosegay or posy with a festive tie. Large vibrant ribbons falling from the flower stems add a pop of color without costing a lot of money. Wrapping the bouquet properly is important for keeping the floral design from falling apart. Use floral wire to wrap the stems and then cover it with fabric or ribbons. Place beading, bows or buttons on the stems if desired. A tuft of pure white tulle is a sophisticated alternative to greenery in a bridal bouquet. Match the tulle design to your veil to pull your bridal look together.